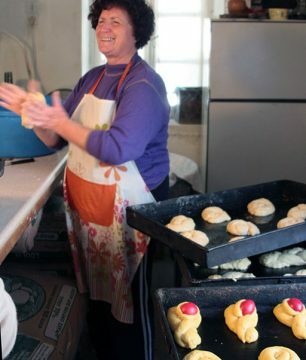 Our neighbor, Vasso, makes tsoureki, the Greek Easter bread, at the village bakery. Easter is the most serious holiday in Greece, a symbolic celebration of renewal and a palpable celebration of spring. 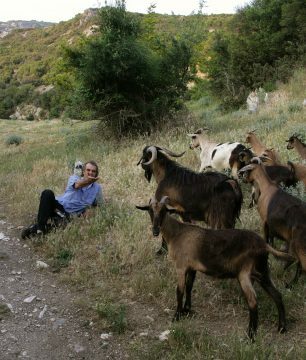 Most Greeks leave the city for the countryside, their exodus as much a yearly ritual as the roasting of the Paschal lamb or goat. For urbanites like me, my husband and kids, touching ground in the ancestral village is more than the chance for an official five days of R&R. It is the rekindling of bonds with fellow villagers whose friendships and ties span generations. The ferry to Ikaria, where our ancestral roots are, pulls into the port of Evdilos at around 2 a.m., after an eight-hour journey with inevitably someone (or many people) on board who we know. The dock, even on a chilly spring night, is filled with familiar faces waiting for kin. It is reassuring to see them year after year, to recognize their cars rolling off the ship, to note that so-and-so is here, that you haven’t yet seen someone else, to nod hello to an extended group of fellow villagers. Those first breaths of island air, rife with oregano and savory, are also the first breaths of freedom from the confining life of most Greek cities. Of most cities anywhere, indeed. On Ikaria, goat is the most popular meat of the Greek Easter feast. Greek Easter is also the time to reconnect with nature. Anyone with a country house—many Greeks hold on to the ancestral home for generations and many more manage to build a country refuge—plants their gardens now. In our area, Raches, the local nursery, a rambling prefab shack, is abuzz with people vying for tomato, pepper, and eggplant seedlings, carrying off trays bright with Kos lettuce sprouts, and heaving stark young fruit trees to the trunks of their cars. Pickups drive by with carriages filled with ashen-haired sheep bouncing against each other bum-to-bum, and scrawny mountain goats laced together at the ankles. Unlike the city folk enjoying the year’s first taste of freedom, the animals are savoring their last, with Easter just a few days away. Thursday is the busiest day of Easter week the traditional day when women dye eggs and make tsourekia, the brioche-like, plaited Easter breads redolent with citrus zest and two unique spices: mahlepi, the kernel of a specific cherry variety, which imparts a woody, sweet aroma, and mastiha, the crystallized sap of a scrub-like tree that flourishes only on the island of Chios. 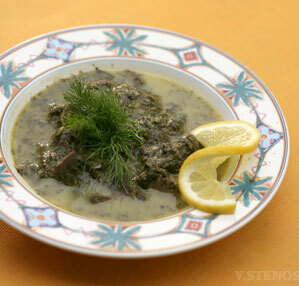 (Mastiha needs to be pounded to a fine powder while mahlepi is made into an infusion and mixed into the dough.) At our local bakery in Aghios Dimitris, a small village that is part of Raches, on the northern side of the island, half a dozen women have taken over the flour-dusted back room. They roll dough ropes, pale yellow thanks to the wealth of eggs in each batch, and braid them into decorative loaves, fitting a bright red egg between the plaits. On Ikaria, tsourekia are called kouloures. Outside the bakery, a few women are done for the morning, and they carry off the black pans, borrowed from the baker, filled with their golden breads. Decorating the Epitaphio on Good Friday in our village on Ikaria. Good Friday is quiet, a day meant for solemn contemplation, but more often than not one spent at the butcher and grocer shopping for the weekend feast. In the morning, women and children bring fresh-picked flowers, both wild and cultivated, with which they decorate the epitaphio, the mock casket that marks the burial of Christ. The custom here is unique: Toward the end of the liturgy on Friday night, the priest leads the congregation on a procession toward the cemetery, blessing the graves of ancestors and loved ones. Good Friday is the most austere of the Lenten fasting days, one in which a lean bowl of boiled lentils, lacking even in olive oil, is the meal for those who choose not to fast completely. Saturday marks the final lap of preparation for the Easter feast. 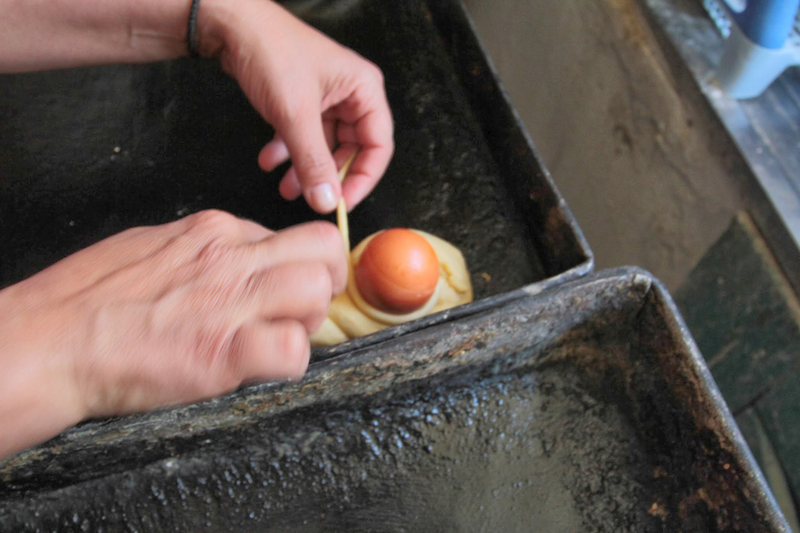 This often includes what is arguably the most unpleasant of preparations: salting and scrubbing and rubbing and scraping meters and meters of slippery intestines, which will be used to make mageiritsa, the traditional lemon-and-egg infused innards-and-herb soup, as well as kokkoretsi, a thick offal sausage held together on a skewer or a vine by tightly wrapped intestine. Kokkoretsi is either baked or spit-roasted and, despite the unsavory elements of its preparation, delicious. 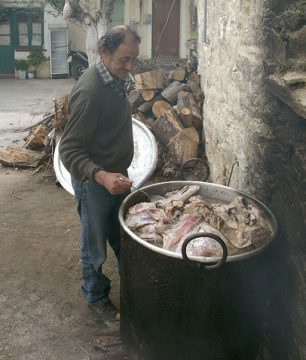 In Ikaria, as on most Aegean islands, goat is the Easter meat and traditionally it was baked in the oven rather than rotisseried over coals on a spit. Now, mostly for convivial reasons, people have adopted the spit-roast tradition of the Greek mainland. Both are delicious, but the stuffed goat dishes offer a glimpse at the microcosm of local flavors. Greek island goat is stuffed whole with rice or, in some parts of the Dodecanese, with bulgur, and a combination of wild, seasonal island herbs: feathery fennel fronds, lemon balm, dill, mint, and fresh oregano are part of the palette of flavors on Ikaria. On the island of Samos, the back ribs, not the cavity, are stuffed. The end result is a dish that has relatively little meat because the cut is lean, but it’s filling nonetheless. Other classics of the Aegean Easter table include shredded salads of Kos lettuce and dill; artichokes braised with carrots and peas or fresh broad beans; cheese pies both sweet and savory and shaped like packets, stars or half moons; boiled dyed eggs and tsoureki, sweet Easter bread, and baskets of koulourakia, crisp, braided and coiled cookies. 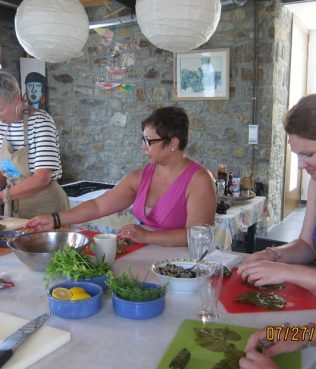 Making the Vrasto, or boiled goat, for the communal feast in our village on Ikaria. Like all Greeks with an ancestral village, I love the customs of my own place. Ikarians eat communally on Easter Sunday, embracing not just their own families but the village at large, in a custom called the mnimosino, or memorial service. In every village, people eat together in the town square, usually in a small building that serves as community center, reception hall and local soapbox. Every able villager contributes some money, buys a share of meat, which is either simmered (vrasto) or roasted (psito) and served free of charge to whoever shows up at the community center. Everyone eats together at long tables, bringing their own wine, salads and any other accompaniments. This is a custom rooted in the poverty of a generation and more ago, when people had little access to animal protein. By setting aside a day or two each year the village was able to ensure that everyone, even the poorest, got to eat a little meat. The feast starts in the “early” afternoon, which to an Ikarian’s mindset is around 5 p.m. But it continues with food and wine throughout the night. At some point, around 8 or so, sated and secure, surrounded by familiar faces, the crowd eases into dancing. The violins start up well after 7 p.m.. A slow, seductive Kariotiko—the island’s dance—is usually the first thing the band plays. A violin beckons the first few souls to the dance floor. By dawn, Easter proper on the northern fringes of Ikaria starts to wind down. The same villagers who helped to prepare the feast, start cleaning up a few hours later….only to begin preparing again because Mondays is usually reserved for a feast redux at home, where family and close friends gather. In our house, the stream of visitors is constant from around 2. p.m. onwards. I’ve done my baking and roasting and shredding and egg-lemon emulsifying. Robust country wine pours freely, people come and go well into the night, bringing offerings of that and more. The holiday lingers, especially in the countryside. By Tuesday, though, when I’ve cleared the last of the dishes and pans, the inevitable reality of return sets in. For me, and I am sure I am not alone in this sentiment, leaving Ikaria is an effort. We try to stay the week, but finally must go. Sailing away from the island, the four of us, and dozens more, stand on deck, soaking up the last glimpse of Ikaria’s rocky cliffs as we pass the lighthouse on the tip and count the days ’til summer when we can return.